My birthday is coming up in a month and I'm using that as an excuse to shop and splurge a bit. 35 feels like a big year and paired with getting a new job back in March, I think I deserve a present (or two or three). I've been keeping a list of "things I want to buy" (fyi: I love making lists! 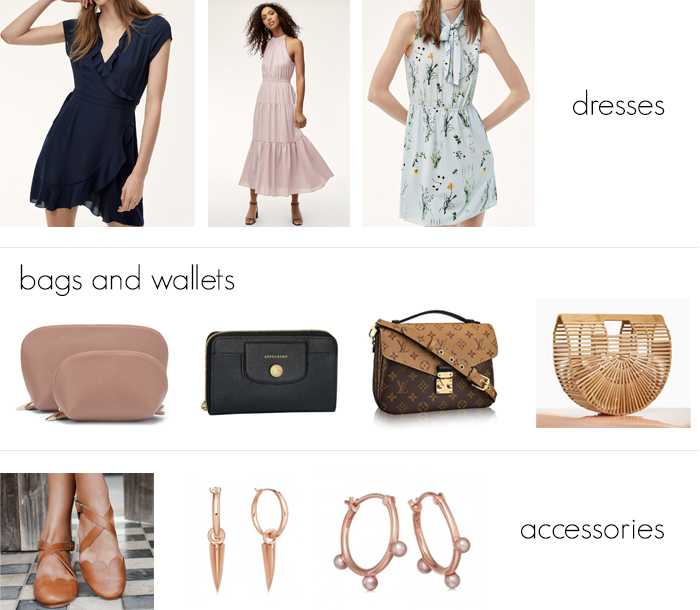 ), so here are a bunch of dresses, jewelry, bags and more that I've had my eye on. Dresses | I am such a summer baby! Whenever warm weather hits, I just want to wear dresses and flats all day, every day. Lately, Aritzia has been one of my go-to stores for dresses and I adore these three. (3) finally this adorable neck-tie dress. (1) This Cuyana travel set has been on my wishlist for forever but now that they just came out with this rose color, I might finally cave. (2) I've been wanting a simple wallet/wristlet combo (I had to crop out the wrist strap for the graphic) and Longchamp's Le Pliage compact wallet fits the bill. Plus I'm just a huge fan of Longchamp and the quality of their products. (3) Ok, so here's the big item on my wishlist - the Louis Vuitton Pochette Metis. My old boss and I would bond over Louis Vuitton (tbh, we still do!) and he's the one who showed me this bag last year. He tried to convince me to buy it for my birthday back then and at the time, I decided no. But I'm still thinking about it! This may be the the year I get it. (4) One of my favorite lifestyle bloggers is Crystalin Marie and ever since she started posting pictures of Gaia's Ark, I've been wanting it! It's not what I normally go for and that's part of the appeal. It's different and fun but something that could be used every summer. (1) I hate to admit this but Instagram put the Bali Elf Mangrove Flats on my radar. They're so feminine and classic but the scallop edges are a nice little twist. (2) I love Missoma jewelry but 90% of their stuff is in yellow gold and I mostly wear rose gold. So when they released a bunch of new rose gold earrings, I immediately browsed and found this pair. (3) Astley Clarke is new favorite! I recently ordered a bracelet from her and now I just want more. These hoop earrings with pink pearl accents are so pretty. I'd love to know which are your favorites!